Trolling motors are essential pieces of equipment for the angler rather new to the sport or have years of experience, are a casual angler or have an addiction. Regardless of what trolling motor you have mounted on your boat, you want reliability, longevity, and a smooth functioning piece of equipment. In this review, we take a close look at the Minn Kota Edge bow mount trolling motor to determine if it possesses these qualities. We at Fishing Tech give the Minn Kota Edge an A- rating. We do our best to base this rating on how well the trolling motor performs with its intended use rather than a comparison to other trolling motors. We do have several broad reviews where we do compare several of the best trolling motors if you are interested. The Minn Kota Edge mount is small but sturdy. It uses an anodized aluminum arm to provide stability to the motor when deployed. The latch and door bracket make this motor easy to remove from the mount with a soft grip knob. Using heel and toe steering, the Edge foot pedal is an ergonomic and responsive pedal for control of the motor direction made from a composite material. It features a speed control dial, a momentary on button, a constant on button, and a heel block. The Minn Kota Edge has two-speed control options depending on the model; a 5fwd/5rev and 5-speed setting that can be easily controlled through the foot pedal or hand tiller. The directional indicator, available on foot control models, is available on all of the foot control models. This feature allows constant knowledge of the direction the prop is oriented. There are two prop styles available on select models. The first is the Weedless Wedge 2 prop which is designed to flow through weeds, and other vegetation with a flared and swept back design. The second option is Minn Kota’s Power Prop. It is the more classic design and provides more power to cut through vegetation. Like all of Minn Kota’s trolling motors, the Edge features a composite shaft that comes with a lifetime warranty. The composite shaft is designed to take abuse, even tremendous stress without breaking or warping. There are several accessories as wells as replacement parts that are available for the Minn Kota that can be bought separately from the motor. We have listed these options below. MK 330PC: 3-bank, on-board marine battery charger with 30 amps of output. MKA 23 Quick Release Bracket: Composite bracket for cable steer motors including the Edge. The Minn Kota Edge is a hard working but simple trolling motor. While there are not a whole lot of model options, there are a couple. There are quite a few differences between all of these models such as the max thrust, the style of direction control, and the speed control. We should also note that the directional indicator, a major feature of the edge, is only available on the foot control models. The edge also uses two types of props, and the type depends on the model. The 45lb thrust, both the hand and the foot control options, use the Power Prop while all other models use the Weedless Wedge 2. The other major difference between these two trolling motors is the speed control option. The pedal control models all have the 5-speed setting while the hand tiller models come with the 5fwd/3rev speed control. This is common as the hand control motor cannot turn the motor head without losing access to the hand tiller. All other features are found on all models including the Edge Mount, Latch and Door Bracket, the composite shaft, and Minn Kota’s motor technology and warranty. One of the best features of the Minn Kota Edge is the low profile mount that is used. It takes up the minimal amount of room while not sacrificing stability of the trolling motor in any way. This is great for smaller boats that might not have the room for a lot of the larger bow mount trolling motors that are available. Installation of the mount is as easy as you make it. The manual that comes with the motor gives detailed instructions on proper mounting of the Edge. The Edge uses a classic pull rope and grip for stowing and deploying the trolling motor. It might not have the assistance that other Minn Kota and competitors have with stowing and deploying but the Edge mount has incredible sturdiness, and it is a lighter motor so manual stowing and deploying is not much of an issue. We like the extruded aluminum arm that runs down the center of the mount connecting to the motor shaft. It gives a lot of extra stability to the motor when it is being stowed and deployed. The motor locks in place tightly when stowed and the mount comes with a built-in motor strap for more security when moving the boat from the water back to the house. You might get a little vibration and slight movement when stowed, but it is nothing that is going to damage your motor or affect its functionality. The Latch and Door design of the Edge mount is also beneficial for those who might need to remove their trolling motor often. With a simple screw-in grip knob, you can easily remove the motor from the mount for storage or to move it to a second mount on another boat. The amount of running time you can get from these Edge models varies on a lot of other factors. The power setting you are running the motor on and the type of battery you are using all impacts the amount of run time you are going to get from these motors. The max amp draw from these motors varies from 42 to 45 so with a good battery you can get a couple of hours of run time even at the highest speeds. You should be aware of how much time you can get, especially with the Edge not having a battery meter. Every potential buyer or a trolling motor is going to be concerned with the controllability and functionality of the motor out on the water. The edge delivers. There are two options for motor control with the Edge; a foot pedal or a hand tiller. Both of these options provide excellent control of the motor head. The hand tiller is ergonomic and easy to use. Speed is adjusted by twisting the handle, and you get solid and audible clicks indicating a change in the speed setting. The hand tiller does not extend which might be an issue for some. With five forward speed and three rev speed options, you can get the boat where it needs to be efficiently. Because it is not digital variable, and this is for both the hand and foot control, you to lose the ability to get the speed to exactly what you want. While there is not a lot of “dead area” in the speed range of the Edge, there is a little jump between the various settings. But nothing that is a problem in our eyes. You also do not feel any lag time or jumpiness when switching between speed settings which is a good indicator of an efficient motor. We like the Edge foot pedal. It has been redesigned and is wider than older models of the Edge. It is a powerful composite material that does well at resisting flex and warping which will make fine control difficult in the long run. The pedal is a toe and heel design for motor direction. You can easily control the speed setting with the dial on the right toe of the foot pedal. There is also a momentary on button located on the left toe of the pedal which allows you to only run the motor when you are ready. There is a constant on switch on the side of the side of the pedal but be sure to have this turned off anytime you don’t want the motor running to conserve battery life and to avoid serious motor damage. The sensitivity of the pedal is excellent with no lag time between manipulations of the pedal and movement of the motor which is excellent for trying to maneuver your vessel in tight spaces and maintain your position for the optimal cast. Overall, this is a quite motor thanks to a lot of innovations from Minn Kota when it comes to the motor design. It minimizes the amount of energy that is lost as heat and dissipates generated heat which greatly increases the battery life of these motors. In the long run, this also increases the lifespan of the motor. A quiet running motor is critical for motors used on fishing boats. It's not just the noise but the vibration that will send fish into a new area or cover ruining a fishing spot for a few hours. Minn Kota uses an advanced bearing system in their motors. These bearings play key roles in supporting gears and cutting down on friction and vibration between moving parts. It gives the Edge an incredibly quite approach at all speed settings. Below is a video that gives you a better indication of the speed and noise level of the Edge. The 70lb thrust model is featured in the video. Trolling motors can take a beating in the span of their use on the water. From dealing with vegetation to impacts from underwater structures, they need to be built well if you want them to last for an extended period. For the Edge, we have already discussed the durability of the mount, including the large aluminum spine. We also love the composite shaft that is used. While it has some give in it when faced with a force put on it, it bends but does not break. More importantly, when it does encounter a collision, the shaft does not warp unless under extreme conditions. Even so, it is under a lifetime warranty from Minn Kota. That should give you an inkling of the confidence the company has in the shaft. The other portions of the motor, including the motor head are made from an impact-resistant composite material. The composite gives the motor excellent durability while not making it overly heavy. The Minn Kota Edge does not have a lot of the tech features of some other trolling motor options, and that is not a con against the Edge. It's built for reliability and affordability which is what some anglers are most concerned with. It does have several features, and we want to focus on how these features help you on the water. With the foot pedal models, we like the directional indicator. It is located on the top of the motor head and is painted with a bright yellow color that makes it easy to see in low light. When you maneuvering in tight spaces or are putting most of your focus on a fish, the directional indicator can save you a lot of grief. 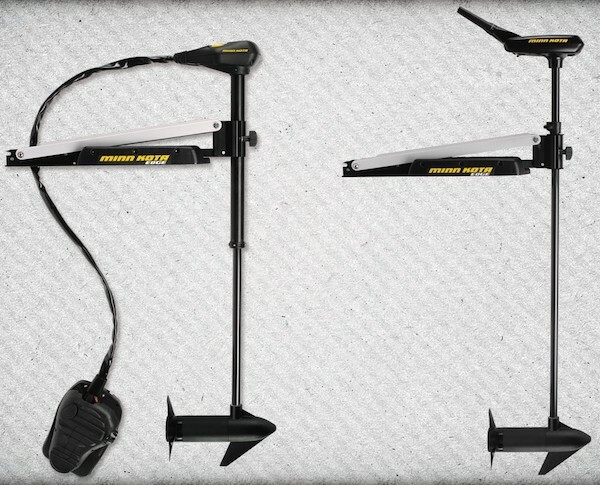 We outlined in the model breakdown as well as the features section the two prop options that you might have when choosing an Edge trolling motor. The Power Prop is a smaller diameter prop, but you are going to get more RPMs without having to use up as much energy. It's great for cutting through underwater vegetation, but with the size trolling motor you are going to be using with this prop, heavy weeds are going to give you some more issues. The Weedless Wedge 2 prop that is used for the 55 and 70lb thrust options is a fantastic prop. It uses a unique design where the blades are flared with swept back tips. While this prop can cut through light vegetation, its design allows it to sweep through vegetation with grace more so than brute force, which helps with battery life and longevity of the motor. The Minn Kota Maxxum is a similar trolling motor to the Edge in its features, specs, and affordability. If we compare the two, we do see some distinct differences. Both of these models feature both hand and foot control options, and both have some overlap in thrust options. The Edge has lighter thrust options that are not available with the Maxxum, but the Maxxum does feature an 80lb thrust model. The Maxxum also comes with several more features than the Edge including a push to test battery meter and a bowgaurd. If you want to look somewhere other than the Minn Kota lines of trolling motors, Motorguide has its X3 bow mount trolling motor that is the closest in features, specs, and performance to the Edge. The X3 has both foot and hand control options and has quite a few more model options than the Edge. While the Edge does provide excellent control, the X3 features Motorguide’s Variable Ratio Steering which is top of the line in control. The X3 also has the option for digital variable speed control that we think is superior to set speed settings. Both the Edge and the X3 have 45, 55, and 70lb thrust options available. The Minn Kota Edge is a great option for those looking for a reliable and affordable trolling motor. It has several thrust options that are going to cover the needs of all but the largest fishing vessels. It’s a stripped down trolling motor that does not carry the features seen in other motors in the Minn Kota line, but we gave the motor an A- rating because it does what it was designed to do well. It’s made from quality materials and built well. You have excellent control over the direction and speed of the motor and it runs smoothly and quietly. When it comes down to it, it provides the key characteristics needed in a trolling motor.